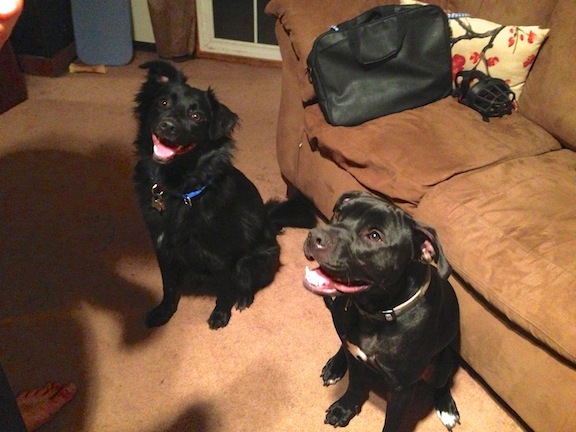 Calvin is a two-year-old male Border Collie mix, pictured here on the left with his room mate Brooks a two-year-old male lab pit mix. I was called in to help with Brooks who had been showing increasing signs of aggression including nipping a few guests. According to their owner, Calvin didn’t have any behavioral issues. When I arrived, Brooks was muzzled and pulling on his leash on the far end of the living room. His body was stiff and his owner was clearly straining to keep him in place. But aside from that, i didnt see any signs of aggression so i told them to bring him closer. He stuck his nose in my crotch (muzzle and all), but didn’t jump up, growl or bark. I offered him a few treats which he took without any aggression. His owners told me that i was the first person he took a treat from in a long time. On the other hand, Calvin was going loco; spinning around, jumping up, barking, invading my personal space and displaying an over-excited, unbalanced and anxious state of mind. Because he clearly couldn’t contain his own excitement, I placed Calvin on a leash and corrected him a few times until he settled down somewhat. When an unbalanced dog gets over excited, they can have real problems because all their expected rules go right out the window. This situation in almost completely limited to dogs who live with humans. In the wild, there is a clear structure in place for all the members of a pack. The members of the pack have and respect the rank and authority of their peers. Members of the pack understand the rules, boundaries, expectations and limitations that are expected. If a dog breaks the rules or displays an unbalanced or anxious behavior, the other members of the pack will immediately react to it, correcting the violating dog. That dog will either change his behavior, be expelled from the pack or be killed. But when dogs start displaying an unbalanced behavior with humans, many dog owners ignore or rearrange things to accommodate the behavior instead of fixing it. This allows the dog to get deeper and deeper into its neurosis which makes the problem or problems worse. 1) Use a distinctive sound to disagree with the dog during (or preferably) before the dog engages in the behavior. We use the word “no” so often, its difficult for a dog to know when its for us vs when its for them. When we use a specific sound, the dog has no question the pack leader is communicating with them. 2) If the sound doesn’t stop the dog, stand up! Standing is the most authoritative position we can be in. By suddenly standing up when a dog is doing something we disagree with, it makes the dog take notice as it sends a “I mean it” message. 3) If standing up doesnt stop the behavior, walk over to the dog and continue walking almost through them so that they move away or sit down. 4) If the dog moves away but continues, then i usually suggest placing the dog on a leash. This allows the best control, and the close proximity to the dog is a great deterrent. If it continues, the human can correct the dog with a quick jerk of the leash. 5) If none of the above work, the next step is to take the dog into another room away from the stimulation they are reacting to. Stay with the dog, but be as uninteresting to the dog as possible. If it tries to play or move around, correct it with a snap of the leash or hold the leash closer to you. At this point you’re essentially giving the dog a time out. Stay with the dog in the room until it settles down and regains a calm frame of mind. By applying these consequences with good timing, we can help the dog learn that an unbalanced or over excited energy results in corrections or a time out, while balanced, calm-energy is rewarded by inclusion into the pack’s activities. I wanted to show Calvin’s owner an exercise to help him learn to respect their authority, to self restrain and regain some focus. So that I could focus on Calvin, I had his owners place Brooks into his kennel. I placed a high value treat between my ankles and stood over it in a guarding position. Calvin immediately moved forward to get the treat, but I stepped forward to block him. He attempted to go around me but I pivoted so that my hips were always facing him and the treat was behind me. Once he stopped trying to go around me, Calvin sat down. As soon as he did, I took a step back so i was standing over the treat again. I paused a moment to see if he would move but he didnt so i took another step back. Calvin moved forward again so I mirrored his movements, moving to block access to the treat when he moved towards it. Usually a dog will continue this for a few moments then eventual lay down to signal they are no longer challenging for the treat. But Calvin started wandering away to the kitchen or other parts of the house. I eventually got him to lie down a few times, but only after blocking him from exiting the room and a lot of coaxing. He was looking in every direction every minute. The definition of a scatterbrain. Im pretty sure Calvin has the shortest attention span of any dog I’ve ever worked with. I changed things up and brought his kennel over into the living room. When I did, I learned that his owners had a difficult time getting Calvin into his kennel and that he often would go and hide under a table to avoid it. As I repeated the “treat toss,” I took a step closer to the kennel each time until i was only a few feet away. The closer i got to the kennel, the more apprehensive Calvin’s body language was. But he continued to go in for the treats. Once he relaxed again and showed no hesitation in going into his kennel, I tossed in another treat then walked quietly behind him until i was standing in the doorway to the kennel. After he gobbled up the treat and turned around, Calvin saw I was blocking the exit. He stood still so i took one step backward. As soon as he started to take a step forward, i mirrored him doing the same. This stopped Calvin, who then sat down. As soon as he did, I took a giant step backward. We went back and forth a little bit, but after about two minutes Calvin laid down. As soon as he did I called him out of the kennel and rewarded him with some nice scratching behind his ears. I repeated this exercise a few times with Calvin laying down faster each time. As we were doing this, the family’s preteen daughter came into the room wanting to know what we were doing and to help. I gave her a few treats and she threw them into the kennel as I had done. The second time she did, i had her walk up to the gate and stand there to block Calvin from exiting. She took a few steps backward from it and Calvin laid down so I told her to call him out. She repeated the exercise a few times and then i coached her parents through it as well. By repeating this exercise daily and asking Calvin to wait in the kennel for longer and longer periods of time (with the door open) he will learn to focus, learn self restraint, respect the authority of his human pack leaders and most importantly to stay calm. After repeating the kennel exercise a dozen times or so, Calvin’s energy level and demeanor had noticeably changed. He was lying on the floor or walking around slowly and calmly. I had his owners place him outside so we could work with Brooks. He started to place the muzzle back on, but I stopped him as the dog was in a calm state of mind and showed no signs of aggression. After practicing the “Leave it” exercise with him, I began to wonder if the aggression he had displayed was related to Calvin’s anxiety and energy. While we had been working with Calvin, Brooks stayed quiet and calm in his kennel. When we practiced the leadership exercise he was respectful and moved in a calm confident manner. When we let Calvin back inside, his energy level had gone up a little and he attempted to start roughhousing with Brooks which made his owners nervous, telling me that I was the first person to be in their home in months without Brooks on a leash and muzzled. I could see Brooks energy level raising to match Calvin’s so we placed Calvin on a leash. As soon as we did, Calvin settled down and so did Brooks. I suggested that his owners start a new regimen for the dogs that includes immediate corrections whenever Calvin starts to get his energy up. If done with good timing, this will teach Calvin that being too excited or wild results in a time-out and no fun. Eventually he will realize that low to medium energy levels dont trigger the corrections or time out. Once this “clicks” for him, he wil start to display a calmer demeanor by keeping his energy level from getting out of control. Placing him on the leash had the best corrective effect, but the exercise with the kennel will be Calvin’s road to rehabilitation. By practicing it daily, he will build up the ability to focus and defer to his pack leader’s lead. Once this happens, Brook’s need to match his room mate’s energy will stop resulting in two balanced dogs who see and respect their pack leader’s authority. This isnt the first time that I was called in to work with one dog only to discover the other dog was the problem. Its a great example of how important it is for our dogs to have clear rules, boundaries, expectations and limitations in order to respect our authority. We may be willing to “live with it” but often their are or will be ramifications. Seeing both dogs lying on the floor in a calm relaxed state of mind at the end of the session proves that all they need is some guidance and leadership from their human pack leaders. Now that they know how to provide it, Im expecting to read a success story comment from their owners very soon.